Head to the Simla Tandoori where you will find an excellent selection of Indian dishes served by friendly staff in a relaxed atmosphere. 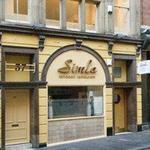 What did you think of Simla Tandoori? Established in 1981 by the same owners, though you would never know it from the modern comfortable decor and the superb subtle lighting. We had an excellent meal, crisp fresh onion bhajiis followed by lamb and chicken curries with excellent saucing. For me the stand out thing was the quality of the meat. The chicken tikka was large moist pieces of top quality chicken and the lamb was lean and tender. Lovely dhansak. Service was polite efficient and friendly, so all in all a cracking curry house and one that I'll certainly return to. Thi is a bogus rview in my opinion. Disgusting food yet 3 stars: come off it pal. My Father took me to The Simla over 20 years ago and and my family and I have been going ever since. Wonderful atmosphere, nice staff and fantastic cuisine .You won't be disappointed. Surprised at the bad review earlier. For us its a decent quite place away from the stag/hen crowd and without the mega decibel background (ok we're over 50). Food was spot on and all freshly cooked with none of the warmed up 'tripe' - even me and the missus couldnt finish off what we ordered. Try the £10.95 limited menu early evening. Will definately return when next in the town. the ONLY way this place would get a bad review is when another curry house gets someone to post a bad review as to pathetically try to boost their own place. If you don't believe me then try the SIMLA and decide for yourself. the food is always fresh and great ,the helpings are huge, and the manager and staff are the best you can find. Top place, my favourite North-East curry house (along with The Sagar in Whitley Bay) - top man in charge, and open very late. It's the usual curry fare, but it's just what you need at 3am in the morning! Ask the owner how his son's doing in the footy!